After showing off its high-tech walking cane and invisible tablet keyboard at Mobile World Congress in February, Fujitsu Laboratories is back with even more tech-wizardry up its magical sleeves. This time, the Japanese company is demoing gear that brings touch and gesture controls to physical things like paper and 3D objects. Using a low-resolution webcam (just 320 x 180 pixel resolution) and a commercial projector, the Japanese company is able to project an interface onto a surface, and then use the camera to track both the shape of the item as well as your fingers to determine what to do. 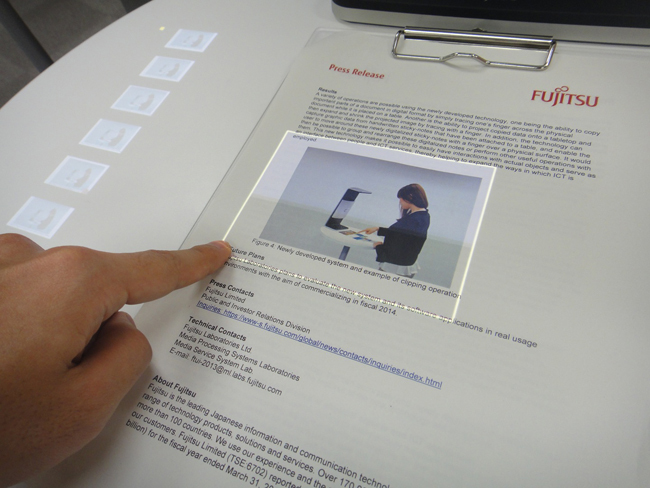 For example, in the video demo from DigInfoNews, the Fujitsu rep is able to digitally crop out just the photo on the printed piece of paper by sliding the sheet under the device, and using only his finger to manipulate the interface projected onto the paper. In fact, toward the end of the video demo, you can see the Fujitsu rep use his fist rather than his finger to rotate his 3D rendering. He’s able to do this because the technology is smart enough to detect objects in all their multi-dimensional glory, so the touchscreen understands gesture controls as well as to touch. According to DigInfo, Fujitsu hopes to bring this touchscreen interface to market by 2014, but it won’t be something that consumers can buy for their homes. The Japanese company thinks the technology could make filling out forms at your local city hall more palatable. What other ways do you think you can make good use of this touchscreen interface?